May 21,2002 I stepped into one of my favorite haunts in Regina, Western Pet Mart, or as it is commonly called "Cow Town". I went there to see if I could get some more of those deals on the bargain table. The table was at the back of the store.....and so was the small animal display. 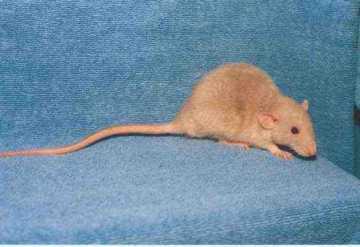 I really had no intention of bringing another rat home, but as I peered through the glass of a huge aquarium housing 4 mom rats and 3 or 4 litters of babies of various ages, my attention was drawn to the most gorgous silver-grey rat I had ever seen. It was a Dumbo *and* a Rex, and upon further inspection, a female. 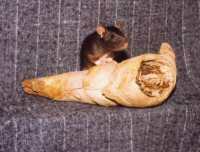 Why was such an exotic animal in a tank of "plain" rats? She looked to be about 4 weeks old, possibly too young to remove from her mom, but I just couldn't leave her there to possibly become snake food? Chrissy came home with me that day, but even weeks later, thoughts of Chrissy's cagemates wouldn't leave my mind. I went back to the store and came home with 2 more girls and 2 more boys...so no one would be alone during quarantine. The boys were really ugly and were immediately dubbed Ugh! and Lee. They were both Rexes and their coats were sparse and had an unkept appearance. I knew I was taking a chance on their health, but a few days on a proper diet, and their coats grew in thick and healthy. They earned the names Jaxon and Leif. 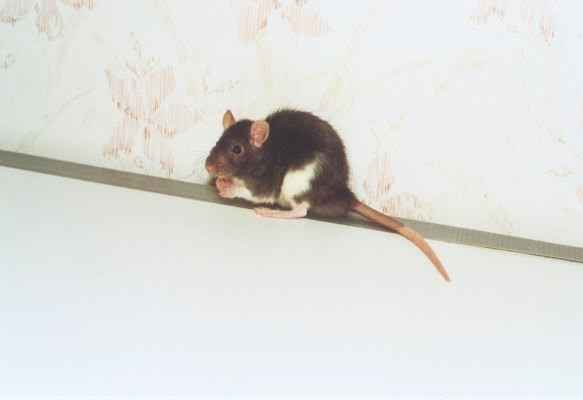 Update January 08,2003: I have recently found a local breeder who had delivered a colony of rats, all females, to Cow Town. Her rats bred with the existing rats and I am delighted to have rats decended from her lines. 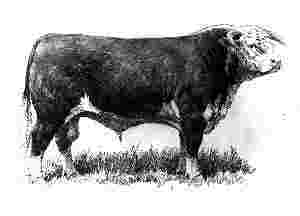 Chrissy, Jaxon, Janus, Leif, and Teensa are all second and third generations from the breeder's original stock. Her lines do carry double rex, which explains the condition of Leif's and Jaxon's coats when I bought the boys home. Leif and Jaxon are and carry the double rex gene. 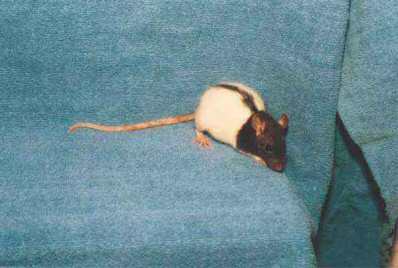 The dwarf gene must have come from the pet store's existing rats because the breeder has no dwarfs in her lines. Chrissy's coat is softly waved and it's the same color from root to tip. She has dark-ruby eyes and the cutest little pink tail, paws, and nose. Jan's dorsal stripe is so close to being perfect.